A senior dog named Bleu and his sister Onyx were surrendered to the Los Angeles City Shelter by their family because they said they just didn't have time for them anymore. The dogs were kept mainly outside, and Bleu and Onyx relied on each other for love and support. Tragically, Onyx was euthanized at the shelter - leaving Bleu all alone with no one left in his corner. Susie's Senior Dogs, an organization that helps older dogs find homes, heard about Bleu and his plight. When they went to visit him, Bleu was slipping into a depression. He would barely look at anyone and just sat in his enclosure, mourning the loss of his sister and family. This poor dog had hit rock bottom, and everyone knew it would take a whole lot to be able to pull him back up again. Susie's Senior Dogs campaigned tirelessly for Bleu and were able to get him moved to Love Leo Rescue, giving him more time and more chances to find his forever home. His new rescue found definite signs of neglect and possible abuse from his old home. He had skin infections all over his body and paralysis on one side of his face from a severe ear infection, but Bleu is a resilient one, and grew stronger and happier every day. When Bleu made it to a foster home, he kept looking at his own reflection in the mirror, as if he had never seen it before. He seemed to have a newfound appreciation for life, despite everything that he had been through. 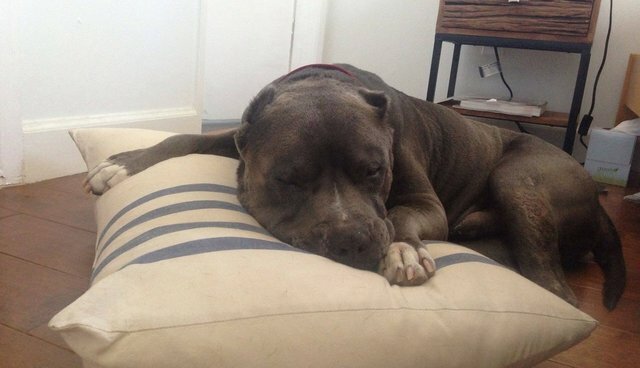 Finally, the day Bleu never thought would come arrived - he made it to his forever home. Bleu was adopted by a couple and their two pups, giving him two new furry siblings. As Susie's Senior Dogs wrote, "His new siblings will never replace Onyx, of course, but love is love and you can never have too much of it." It's so incredibly true. That's me lounging with my foster sister, Ona. I really do love just hanging out with other dogs and humans. Will you let me love you? I'm up for adoption! Bleu will likely never forget Onyx, but now he has a new loving home indoors and a new life to live, and he can live happily knowing it's all exactly what Onyx would have wanted.